This guide will list all the things that you will need to receive an apartment in Japan. The first thing you will need to receive an apartment is a visa. Once you receive a visa you'll get a residence card. In some locations it is required to have an address in back of the card before you can sign the contract. Even though you just arrived in Japan. This is something that your realtor should help you with if need be. If not yet in Japan you'll receive your new card once you arrive. Retrieving a new card can be done fairly quickly. If you do not have a long-term visa for example a year or longer. Than you can only receive a limited number of short term apartments or share houses. About 99.9% of the time you will need a real estate agent to receive an apartment. A good realtor is the most important thing that you will need. As a foreigner it can be very difficult if you do not have the proper guidance. There's a lot more than just signing a contract. The whole process usually takes about a week. It's definitely best to have someone that can guide and help you every step of the way. There are many things that will be new to you so a realtor that speaks English is best. You will need a Japanese phone number to apply for the apartment. It is possible to use a number from outside of Japan through special services but that option is very limited. If you do not have a phone yet but your current phone still has Internet access. Then you can simply receive a Japanese phone number through Skype or any other services. Most apartments require a copy of your pay slips from the past few months (usually 3 months). If employed and have been working for less than three months or have just started. You will be able to show the contract form your job as proof of income. The contract should show a yearly or a monthly income. Most apartments require your salary to be 3 times than of your rent. If self-employed, receive a scholarship or any other income. You will have to show either a yearly income slip or a copy of your latest bank statement or bank book. If you receive no income at all but have a significant amount of savings. For example showing an amount that is two or three years of the rent. Than this can be possible for a limited amount of properties. Not all apartments can accept information from a foreign bank. Your emergency contact should be a Japanese citizen and an adult. In some cases a permanent resident that speaks fluent Japanese can be acceptable as well. You will need to provide their full name, address, phone number and place of employment. They are not responsible financially and only contacted if there is an emergency. In some cases it is required to have a Japanese bank account. The reason for this is if the landlord wants to take the rent out of your account automatically. If you do not have a Japanese bank account or haven't planned on making one. It is best to wait to see if you need this or not. If you do need this as long as you have your residence card it shouldn't be much of a problem to set up an account. In some cases for the contract you will be required to have a Japanese stamp. Finding stamps for sale is relatively easy but because you have a foreign name. You will have to go to a special shop. These shops specialize in making custom stamps. The cost of the Stamps will range between 2,000 to 5,000 yen. Once again this is only for some cases so it's best to wait to see if you need this. In some cases it is required to have a Japanese guarantor. This is basically a cosigner that should be a Japanese citizen. About 50% of rentals require this. All of the properties that we list on our website do not need a guarantor. To learn more about guarantors here in Japan take a peek at our article about guarantors. This list comes from years of experience helping foreigners receive apartments in Japan. I hope this article relieves and answers any of your concerns of what you will need. 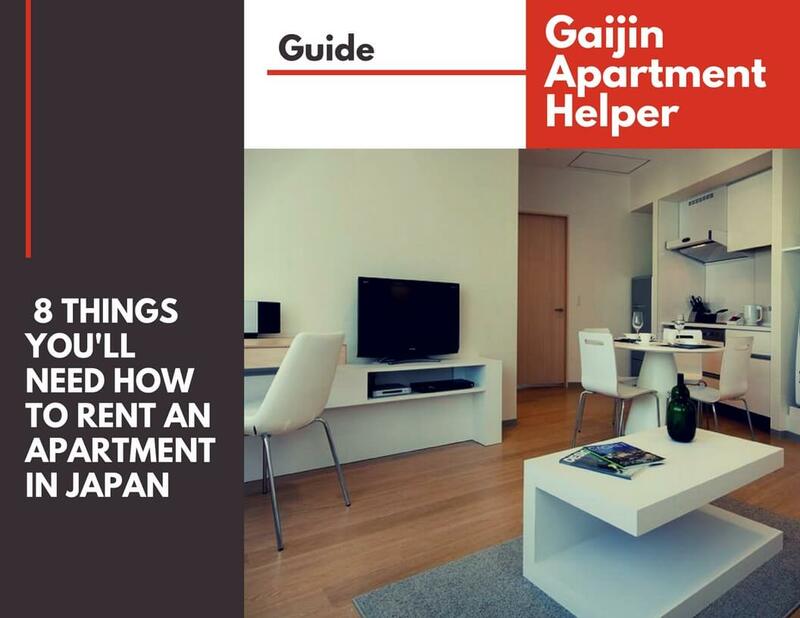 Here at Gaijin Apartment Helper we are here to help so do not hesitate to contact us.